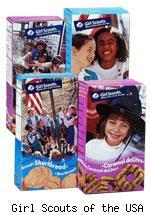 Girl Scout Cookies: Old favorite, learning opportunity, or clever scam? For me, Girl Scout Cookies are an old favorite, and though most people don't know it, they are also intended to be a learning opportunity for the Girl Scouts. No, they're not a clever scam, although some people would have you believe that they are. It's a shame that the misinformation promoted by those people might cause some to not buy Girl Scout Cookies. The boxes of cookies are meant to be sold by the Girl Scouts themselves, and not by their parents or troop leaders, and they are not to be sold on the internet. The cookie drive is not just a fundraiser for the non-profit organization. It's also meant to be a chance for the girls to try their hand at creating goals, making a plan to sell, handling money, using math skills, and a number of other educational goals. Some criticize the organization, however, because of the perception that the Girl Scout troops receive very little money from the sales of the cookies. That's just not true. Geographic areas work together to set the prices of their boxes of cookies (usually between $3.50 and $4.00) and to decide how to divide the money. In one area, a box sells for $3.50, and troops receive at least 55 cents per box; more if they meet certain sales targets. In another area, a box sells for $4.00 and the troops receive at least 60 cents per box. These troops are getting 15% to 16% of the sales price. What business do you know that has a 15% or 16% bottom line profit? Many small business owners who sell products will tell you that's not a bad profit by any stretch. Consider the costs that go into each box of cookies: ingredients, labor, equipment, packaging, marketing, and the cost of running the cookie program. Yes, there are two bakeries that make all of the Girl Scout cookies, and they likely profit from this venture. Why shouldn't they? They are in business to turn a profit. According to the Girl Scouts website, all of the profits from the cookie sales stay in the geographic areas in which the cookies were sold. So the sales definitely have local impact and all in all, are a worthwhile investment in the young ladies selling them. It there's anything scammy about Girl Scout cookies, it might be how good they taste and how few are in a box. If you're going to make a yummy cookie, at least give me a big box of them!